Oisin Tymon, the Top Gear producer physically and verbally attacked by Jeremy Clarkson, has told police he does not want to press charges. The 36-year-old suffered swelling and bleeding to his lip in the altercation, which took place in a hotel in North Yorkshire. In a statement Mr Tymon's lawyer, Paul Daniels, said: "Mr Tymon has informed the police that he doesn't want to press charges. "The events of the last few weeks have been extremely unpleasant for everyone involved. The matter has taken a great toll on Oisin, his family and his friends. "Quite simply, Mr Tymon just wishes to return now to the job at the BBC he loves, as soon as possible. "Further, the BBC have, in his view, taken action with a view to addressing the issues at hand. "Mr Tymon agrees with the BBC's stated view that all parties should now be allowed to move on, so far as possible." Media captionJeremy Clarkson: "I wish people would leave Ois alone"
The producer, who previously described Clarkson as a "unique talent", has come under sustained abuse on social media for his involvement in the dispute. Speaking outside his home on Thursday, Clarkson asked fans to show restraint. "I wish people would leave Ois alone because none of this was his fault," the presenter told reporters. Mr Tymon never lodged a formal complaint with the BBC following the altercation with Clarkson, which took place on 4 March. The internal investigation was prompted after the presenter reported himself to Danny Cohen, the corporation's director of television. Image caption The BBC's director general said Clarkson has "crossed a line"
The investigation found that Mr Tymon was subject to an "unprovoked physical and verbal attack". The physical altercation lasted "around 30 seconds and was halted by the intervention of a witness," said the report's author, Ken MacQuarrie. As a result, the BBC's director general, Tony Hall, said he would not renew Clarkson's contract. "For me a line has been crossed," he said on Wednesday. "There cannot be one rule for one and one rule for another dictated by either rank, or public relations and commercial considerations." Lord Hall said he "not taken this decision lightly" and recognised it would "divide opinion". Following Mr Tymon's decision not to press charges, North Yorkshire Police said the force was still investigating the incident. "We are grateful to Mr Tymon for clarifying his position, as we can now take this fully into account," said a spokesman. "We have some final interviews to complete with guests who witnessed the incident as their perspectives also need to be considered. "When these conversations are complete, we will issue a statement on our website as appropriate." 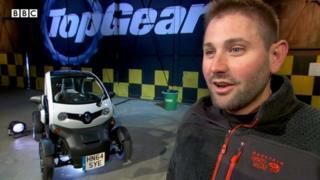 Top Gear: Who will replace Jeremy Clarkson?